We first started this memory testing series in response to questions as to whether it was better to have more memory or a matched pair of memory in Apple iMacs, Mac mini, and Macbook Intel Core Duo models. The results have been and continue to be very consistent. Having more memory is always a benefit, even if you are only able to add/replace one memory module at a time. How much memory you install and when you do it is entirely up to you and your budget. Amazingly, upgrading to more memory in the iMac you already have can actually deliver a larger performance increase that from buying a new one with just base memory! There is hardly any better return on investment you can make for your iMac than when you boost its memory. Economical, Easy to Install, and gives a real performance boost that you’ll immediately appreciate. Adobe Photoshop CS3 is the newest, Intel-native iteration of the popular image editing program. 3.06 GHz Core 2 Duo Not Tested Not Tested 66.88 Not Tested 57.44 56.56. This test times how long it takes to run our standard 21-step Photoshop action in Photoshop CS3 when 50% othe installed RAM is taken up with another program. Lower times are better. 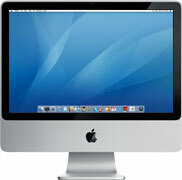 * Changes in the default installed OS for the 2008 iMacs have resulted in lower than expected scores for those models. We are looking into the cause of this. It should be noted, however, that the improvement gained from additional RAM remains relatively the same. For this test, we checked all the options except for the Disk Test, as it was the only one that did did not either touch System memory or Video Memory. Higher Point results are better.